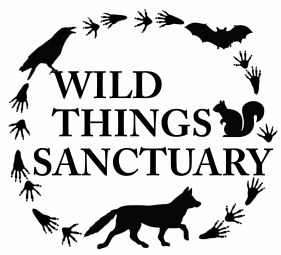 The best way to help wildlife is to educate yourself about the wild things that surround you and your home. Make sure that you do the best you can to protect them and to live together peacefully. Watch your pets when they go outdoors. Dogs and cats don’t know that “playing” with a turtle or flying squirrel can harm and kill those animals! See the “Cats & Wildlife” page for more information. 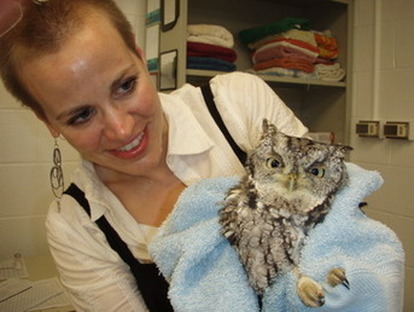 Working with an Eastern Screech-Owl who was hit by a car. Think about using biodegradable cleaning products and toiletries so that whatever gets washed down your drain doesn’t end up poisoning the groundwater and the wildlife that depends on it. There have been more and more findings that animal populations that rely on water supplies near places that wash a lot of waste or medications down drains are in poor health. Also, switch to an animal friendly anti-freeze for your car or truck. Many animals like the taste of antifreeze and will readily consume it when given the opportunity. However, antifreeze, even in the smallest amounts, can be deadly: as many as 88% of animal encounters with the toxin will end in fatality. There is a less toxic alternative to the ethylene glycol-based antifreeze that is most commonly used. Pet-friendly antifreeze is propylene glycol-based and is now available at many retail outlets. It has anti-corrosive properties, is biodegradable, and is recyclable, making propylene-based antifreeze a better choice for the safety of pets and wildlife, personal health, vehicle engine protection, and for the environment. Try Prestone LowTox and Sierra AntiFreeze brands. Turn your property into an official Wildlife Sanctuary. Even a city apartment balcony can hold a bird feeder or butterfly garden. If you have a sincere desire to help wild animals by enhancing habitat on your property and committing to humane approaches for resolving conflicts with wildlife, join the HSUS Urban Wildlife Sanctuary Program. You'll get lots of ideas on how to make your property the best it can be for our fellow creatures. OIf you want to turn your property into an official wildlife sanctuary, take a look at the HSUS Wildlife Land Trust Program. ​Remember that the animals were here before humans moved in, and they don’t mean to be a nuisance, but sometimes they don’t have other options! ​For example, deer used to have unlimited acres to graze, but with human settlement, these acres have become less and less, so they can’t help it if they help themselves to some delicious garden shrubs! If this bothers you then learn about plants that deer avoid and plant these in your gardens, or put guards around your plantings to protect them from hungry deer! Read the Living with Wildlife page to find animal friendly solutions. 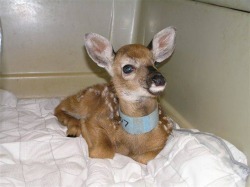 A White-tailed deer fawn recovers at a rehabilitation center.